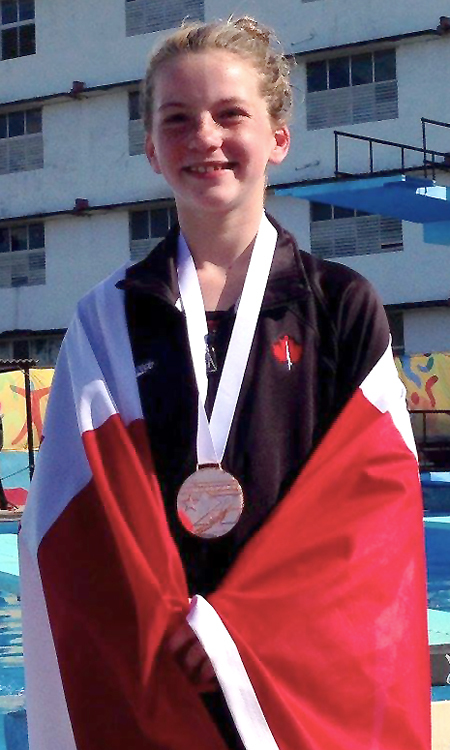 KATHRYN GRANT WINS BRONZE IN CUBA! Go Canada Go! This could be heard from all corners of Cuba as we attended the 2015 Jr. Pan American Games held in Metanzas, Cuba last week. 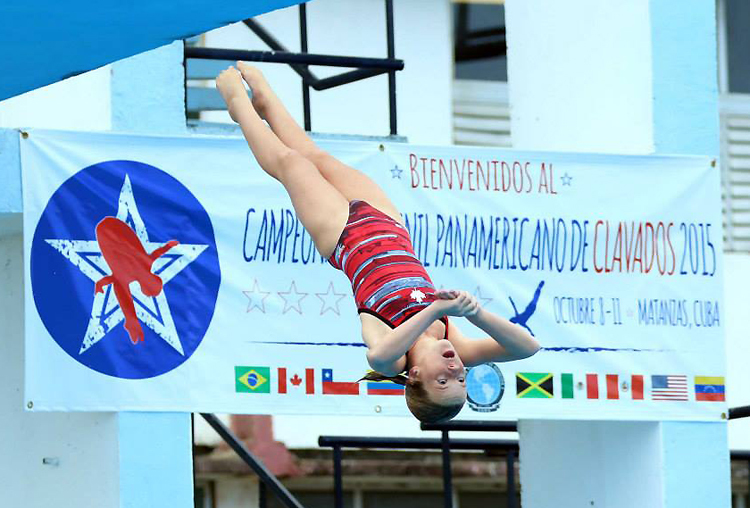 This historic event marked marked the first FINA sanctioned event in over 24 years and was the largest Jr. Pan Am Games EVER! Team Canada travelled to Cuba with one goal in mind: To show that we are proud to be Canadian. To say that we simply accomplished this goal would be a severe understatement. Our team proved to be the strongest group that Canada has ever sent to the Games. With a team of 24 athletes, 8 coaches and staff members we returned home with 27 medals, a total of 9 greater medals than the previous games. “We’ve got some really good talent going on right now” says Mitch Geller, chief technical director of Diving Canada and the man with the vision behind bringing this event to Cuba. Among the 27 medals that our athletes brought home is ONDC’s own Kathryn Grant! At just 11 years old, she showed that she is a force to be reckoned with in not only Canada but the entire western world. 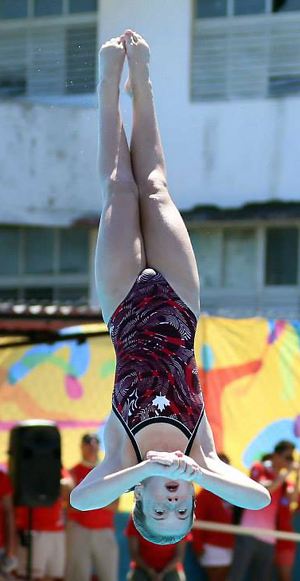 She returned home with a BRONZE MEDAL on her 3m event and finished 4th on the 1m and tower events just shy of podium finishes by less than 1 point! I am so proud of you Kathryn, you represented Canada beautifully. 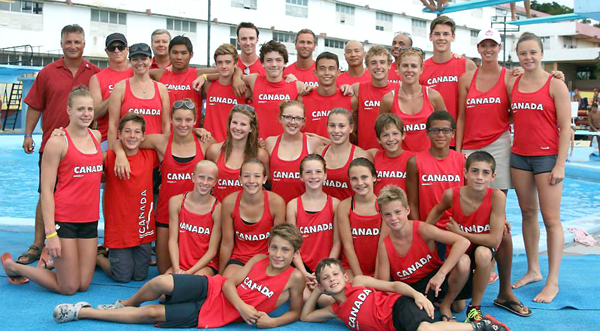 All of our Canadian athletes and coaches demonstrated that we are one team, one nation and one family. This unity and support for each other was unparalleled and could be felt from miles away. From the cheering on deck to singing our national anthem with pride for our medalists, you have given me memories I will cherish for a lifetime! At this time, I would like to thank all parties involved. Diving Canada for their amazing leadership and hard work to make this event a reality. With a special thank you to Mitch Geller, Luc Filion and Arturo Miranda for their extended efforts to ensure that every aspect of the competition was perfect and that Canada’s experience was memorable. You have accomplished that and much more, thank you! Another thank you to all of the volunteers of Cuba for their help and hospitality. To the judges, officials and technical members of all countries and finally to the athletes and coaches of Canada. You have made this trip the most memorable trip to date!